NOTE: At the bottom is a link to subsequent "The Stete Of The Gravel Scene" posts after 2018. If you have any comments or suggestion, you can always e mail me at g.ted.productions@gmail.com Thanks! The beginning of gravel grinding goes way back before my time. It was going on all over the world, but here in the Mid-West, and specifically Iowa, the idea of training in the early Spring winds on higher resistance roads, ( gravel roads), was called by those old time roadies by a name. That name was "gravel grinding". This activity was going on in the Lincoln, Nebraska area when you could join in on any friendly group training ride that featured a bunch of college students getting ready for the mountain bike race season. That group later became the nucleus for the "Pirate Cycling League" which then started putting on gravel rides on purpose, eventually becoming the promoters of Gravel Worlds. This activity was going on in Kansas where a wily promoter named John Hobbs was putting on an event dubbed the "Flint Hills Death Ride" for anyone foolish enough to test themselves against the 70-ish mile course in the heat of Summer. This long before any hint of a Dirty Kanza ever was thought of. There were races and events all over the nation. Paris-Ancaster was going on in Canada long before the term "gravel grinder" was a well known thing. Events in California that would later become the Belgian Waffle Ride were happening on the back roads of California long before this scene was a thing. Mountain bike promoter Richard "Deke" Gosen was putting on gravel road events for mountain bikers in Northeast Iowa in the 80's. Rides like the Colfax 40 were a thing for roadies that were crazy enough to bomb gravel descents at 40 plus miles an hour long before Trans Iowa existed. So, why now and why is it any different than it was then? Isn't it really all about racing, feats of strength, and roadies and mountain bikers getting their kicks on gravel? Well, it was in some cases and not in others, but something changed all that. Ironically, it was an ultra endurance competition that happened at the right time. The scene in terms of cycling in the early 00's was a very different one than we enjoy nowadays. The mountain bikers were all about going around in circles for 24 hours back then, Road cycling was enjoying the rise in popularity brought on by the "Lance Effect". Fixie freaks were tearing it up in the major urban areas. An oddball contingent of single speeders were having their own World Championships. The "latest thing" was 29 inch wheels, but everyone knew that would never catch on. There were no fat bikes, plus bikes, enduro bikes, road plus, endurance road, or e-bikes. No one had ever heard of "gravel grinding". It was in this atmosphere that Trans Iowa was born in. It drew from the ethos of 24 hour racing due to its main creator, Jeff Kerkove, who was a sponsored solo 24 hour racer. It also drew from a nascent movement that was an outgrowth of 24hr mountain biking and was driven mainly by Mike Curiak who was busy helping set up "ultra-endurance" length challenges like the Great Divide Race, the Iditarod Challenge, the Kokopelli Race, and others. This was all happening pre-social media and post "analog marketing". So, the internet cycling forums were then the "cork message boards", the cycling blog was the "digital flyer", and the new PC based culture which was quickly taking root in everyone's homes was the conduit for the messages about all these new, oddball ideas that were out there waiting to be found by a curious populace. I'm maybe being a bit laborious about the set up here, but this is all about the set up. If you miss this, you will miss why it was Trans Iowa that was the first domino, and not some other event. It could have been something else that kicked this whole thing into motion, but it wasn't. Understanding the setting in the days leading up to that November 2004 announcement of Trans Iowa is necessary to attain any understanding of what came afterward. Ironically, for some of you, I had nothing at all to do with it either. I was simply along for the ride. The man who pushed that domino over was Jeff Kerkove. When Jeff Kerkove said "Let's do it! ", in late November 2004 after hearing my thoughts on whether a cross state gravel route was possible or not, something in the atmosphere changed. That evening he put the word out on the internet and before we ever had any inkling of the "how" about Trans Iowa, we had people asking us "How are you guys setting this up?". Once we had some semblance of the "how" formulated, it set off a million light bulbs across the nation. People, almost immediately, started scheming how they to could get in on this action. "Back in 2005, Trans Iowa was created by a couple of free-thinking bike shop jocks with too much time on their hands and too little sense to understand that one simply does not ride a bicycle across the State of Iowa on 340-ish miles of gravel roads, on an unmarked course, with no team support and no aid stations, in less than a day and a half in April. You just don't. And nobody would want to, anyhow. Mark Stevenson and Jeff Kerkove, however, dared to think otherwise. Unconstrained by an aristocratic governing body, or by any other conventional thought, they dreamt up a mind-bending ride that challenged what one thought of as possible and then opened it up to anyone curious enough to give it a shot. In return, they asked for little more than a commitment to show up, follow a few rules of conduct and ride with all you have. A culture was born. I discovered the initial Trans Iowa on the mtbr.com forums, simultaneously intrigued by the challenge and baffled as to why anyone would want to do such a thing. But ride it they did, creating gripping tales of brave souls willing to go way out there just to see what's way out there, and to find what's within. Even afterwards, racers struggled to articulate their near mythical experiences deep into the gravel hinterlands of central Iowa, far beyond their perceived physical and emotional boundaries. Something special was happening out there. As the years passed, Trans Iowa took root and endured, building a grass roots following, unleashing a legion of converts and sparking a movement across the country. All sorts of different grass roots gravel races, events and rides sprang from this humble beginning in Iowa." Craig was just one of hundreds, maybe thousands of individuals who had that "a ha!" moment when hearing about Trans Iowa. Like I said before, it could have been any event that sparked this trend. Jeff and I were just pulling the trigger at a time when the cycling community was looking for something new, challenging, but not over-organized and stuffy. The loose knit, rag-tag bunch of ultra-mountain bikers, thrill seekers, and yes, curious roadies that made up the nearly 50 or so riders in that first Trans Iowa reached a new audience of riders across the nation with their accounting of the event on-line. This in turn sparked the "we can do that!" attitude of other riders across the nation and before you knew it, a small but enthusiastic group of riders and promoters were gabbing about "gravel grinding". Just like my friend Craig. I think there were a few key things that helped spark the gravel grinding scene then. No oversight, no governing body. You didn't have to deal with anyone else's idea of what gravel cycling looked like. You could frame an event in any way you wanted with no licensing fee, no extras to buy, and if you wanted- no insurance. You could even charge no entry fee. This knocked down a lot of barriers to event production and rider participation. You could do this on public roads almost anywhere in rural areas. This meant you didn't have to pay a venue to have an event. You could invite anyone to come. It wasn't a "roadie event", a "mountain biker event", nor was it tailored for any specific group of cyclists. Anyone and everyone was welcomed, and as it turned out, they were accepted. Keep in mind that entry fees for 24 hour events were dabbling into triple digit territory. Especially if you were a solo rider. Criterium racers had to purchase a license for the year, and pay for races, and risk getting pulled after a couple of laps. Mountain bikers faced licensing fees, race fees, and if you were a Sport Class rider, about an hour or so of trail time before your event was over. This didn't include traveling fees, time spent training, and equipment costs. Plus many of these events, both road and off road, were criticized for their cliques and the airs people gave off which were mostly described as off-putting. Only the 24 hr mtb crowds seemed to be chill and not so uptight. Gravel races offered a clear alternative to all of this. With easy access to a way to spread information on the internet, (free), and low barriers to event promotion, venue areas, and participation, the gravel scene found literally thousands of rider/fans within a few years. You didn't need a special bicycle, you didn't have to buy a ton of fancy equipment, nor did you have to worry about how you might be accepted if you showed up on a Motobecane from 1972 or if you wanted to ride a 29"er single speed. You weren't judged for your kit or if you ran a saddle bag or not. "The Rules" of gravel grinding were that you were honest, open, and ready to have fun. It's no wonder then that the scene started to take root and grew incrementally every year. The first six or seven years of the gravel scene were heady years. The events were fun, very grassroots oriented, and the overall vibe was of excitement and camaraderie. For the most part, these events were cheap to enter or even free. Participation numbers in some events soared. Then about 2010 or thereabouts a shift in the scene was felt. Plans to make some events different than they were ruffled feathers. The bicycle industry was taking notice and was starting to make "gravel specific" bicycles and accessories. Series started popping up. Backlash was coming from several sources. Over the past decade, gravel events have exploded in popularity and have become, for all intents and purposes, completely mainstream. One benefit to that is that the events have become incredibly easy to find and attend. But with all of that has come bigger crowds at some of these events. Along with these crowds has come a perceived need to bring the overall level of these bigger events up to suit the monetary and attendance needs/goals of promoters, insurers, sponsors, and the host cities. Bigger, better, and many times far from where the roots of gravel grinding began. On the other hand, riders keep pushing to get into some of these events. Riders keep paying ever increasing fees to have the opportunity to ride in some of these "bigger" events. It can also be said that many riders have a predetermined idea of what an "event" entails and expect certain features and amenities. It is important to note that riders do not have to do these events or pay for them. But they often do just that. So, you can argue that the demand is there, so why not satisfy it? Fair enough. In any segment of society, it seems to me at any rate, that we here in the USA feel "growth" is how we measure "success", and growth is often measured by the metric of "numbers of people" and "amount of dollars generated". This concept, in my opinion, is deeply flawed and it is why movements, genre's, products, companies, churches, and more become bloated, less meaningful, and eventually implode upon themselves. Is gravel grinding at this point? Shouldn't we be more concerned with the "growth of people" instead? ".....when they (gravel events) become like a commodity.....it is a "bought and sold" experience. The money kills the spirit of the experience." While some folks from the early years of gravel grinding bemoaned where some of the events were headed, there were also signs of things within the scene that were years ahead of other forms of cycling. One of these was how women were/are treated at gravel events. The all inclusive nature of gravel events meant that, much of the time, there were no shorter courses for women. Payouts generally are level across the board, and prizing has typically been fair across gender lines. This in stark contrast to Pro cycling events. While women were not quick to flock to gravel events, the numbers of women riders has increased recently by surprising numbers. Events have embraced ways to try to encourage more female participation. In terms of gender equity, gravel grinding as a genre seems to be at the forefront in the competitive cycling world. That isn't to say that there still isn't a lot of progress left to be made there, by the way. The move toward just having fun, recreational rides has been there from the beginning and this facet of the scene has also been on the rise. Since I have the unique viewpoint afforded to me by having kept a gravel cycling event calendar since 2008, I have noticed that recreational, fun, challenge type events, and even family oriented rides are increasing in numbers every year. These are not just some side show either. The numbers for these events are a significant fraction of the overall number of events. Many of these rides are part of larger, competitive events as well. This isn't just about competition. Like I said in my first post in this series, and it should stay that way. I would argue that this facet of the gravel scene actually needs more attention and fostering by the cycling industry. While there have been a lot of changes, some things haven't changed. Most gravel events still are relatively chill, low key events which still feature that welcoming spirit. There are still plenty of the self-sufficient, "You Are Responsible For Yourself" types of events out there also. Gravel grinding's roots are still on display for all to see in many corners of the country. No fear of that disappearing anytime soon, thankfully. You can still find free to enter events, like the classic Almanzo 100. The grassroots, no sanctioning body, free-form type rides and events were still being invented and produced in 2017 just like they were when we did that first Trans Iowa. The last Interbike show I went to was in 2013. I was editor of the now defunct "Twenty Nine Inches" website and I was cruising the halls of the showroom floor at the Mandalay in Las Vegas for the latest big wheeled things. I received a message that Steve Hed of HED Cycling Products wanted to meet with me. I was a bit perplexed by that request, since HED was all about triathlon and aero stuff. Hardly the beat of a 29"er mountain bike site. But, although I considered not going over, I decided to show up. I was about to be blown away. Steve knew I was into the gravel scene and that I ran Trans Iowa. He wanted to show off his gorgeous custom built steel gravel bike to me. It was built by Eric Noren of Peacock Groove. But beyond the bike, Steve was really interested to make sure I understood he was really a "gravel grinder" at heart. He said that was where his heart was. It was how he enjoyed cycling as a youth in Minnesota. His ongoing focus was going to be more about this gravel grinding culture. Not racing- but just the whole idea of enjoying friends and nature out on crushed rock and dirt roads. Sadly for us, Steve passed away the following year and never got to push his passion for gravel to the fore, as he said that he wanted to. However; I feel that he was dead nuts right. He got what the scene needed to be about. Shaved legged, skinny young men on dirty drop bar bikes with dropper posts doing silly mountain bike-like things is definitely not what it is about. However; much of the industry is trying to re-frame gravel cycling as a pseudo-enduro, "bro-culture", rad activity that isn't inclusive of the average ordinary individual who is seeking fun, a safer place to ride, and wants a social aspect to their experiences. Neither is the industry getting it right with regard to the bike packing aspect of gravel cycling. If your scenery doesn't include a mountain as a backdrop, you're seemingly not "getting it", according to the small niche of folks driving this genre. "Routes" that are pre-packaged as "epic" bike packing experiences don't seem to include any gravel rides to a local State Park in non-mountainous areas, but maybe they should. There are probably more people that could relate and see themselves doing that instead of some grandiose Chilean jaunt hardly anyone will ever get to experience. So, you may be thinking, "All right Guitar Ted. What are you going to do about any of this? Qwitcher bellyachin and give us some ideas on solutions!" Fair enough, and in fact, I have been planning all along to do something in my own back yard. 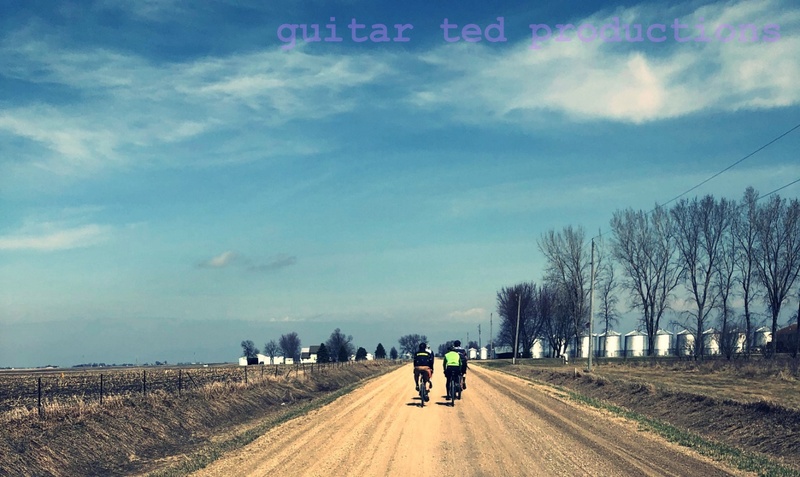 Editor's Note: An event was planned for helping locals to Guitar Ted get acquainted with the gravel scene. This detailed info was struck from the original text for this page since it was time sensitive and irrelevant to the discussion in the future. The point being that Guitar Ted was actually doing something, not just spouting off about it. So, there ya go. That's what I am going to do. Who is next up? Gravel cycling has a lot to offer the person interested in human powered activities that is capable of taking part in them. It isn't for everyone, nor can just anybody take part. That said, more people would cycle if they felt safer and felt that they had a community/social aspect of that activity to enjoy. First off, considering the battle between bicyclists and those trying to drive on paved roads, we are not going to see more people take up cycling until it is made safer. That isn't going to happen for paved road cyclists anytime soon. Meanwhile, distracted drivers are taking chances with all user group's lives and this presents another issue that affects both urban and rural drivers and riders. This issue also doesn't look to be getting solved anytime soon either. While we as cyclists have a right to ride on the open road, it doesn't matter to my family that I have that right if I end up maimed or dead. Does this mean we as cyclists should just give over? No! Not ever! But in the meantime, I would rather be riding where I don't have that worry so present to mind. I would like to enjoy the ride. I really cannot do that currently on paved road routes. I can do this on gravel roads though. Ironically enough, while there are exceptions, the vast majority of other gravel road users are kind. Not to mention the much lower traffic counts. I can ride 40-50 miles and maybe get passed by one or two vehicles. Maybe none at all. The peace of mind this lends me is, in my opinion, priceless. Add in the scenery, the historical elements out there, the wildlife, and the challenges of roads not cut into the earth as much as they roll with the terrain. It is an experience that is diametrically opposed to the one I used to have when I rode paved routes in the country and a far cry from urban cycling. It is an experience I believe is so superior to traditional road cycling that I cannot see myself ever even wanting to ride paved roads again. Not the way things are now, at any rate. The State of Iowa has the unique honor of hosting the largest paved cross state ride in the nation, and it is also the longest running. Of course, I am speaking of RAGBRAI. Technically the ride happens on "open roads", but for all intents and purposes, the ride takes over the roads to the point that you just do not think about dealing with automobiles and trucks. Other cyclists are another thing, but cars and trucks are not an issue. The social aspect of the event is also a big draw. It is my contention that these two characteristics are the main draw for RAGBRAI. Now if, on a much smaller scale, a community of riders springs up and does gravel rides periodically throughout the year, that same feeling could be a thing out in the country. My contention is that this sort of situation could immediately be grown and implemented across much of this nation. I feel it would draw a lot of folks out to bicycle that are not doing that now. Oddly enough, this was exactly what happened in the late 19th Century and early 20th Century with cycling. It still happens this way in Europe in many places. I'm saying, "Why not here?" So, Just What Is This? C.O.G 100 Event Report: So, What Was That Like?